Ion channel gating is essential for cellular homeostasis and is tightly controlled. In some eukaryotic and most bacterial ligand-gated K+ channels, RCK domains regulate ion fluxes. Until now, a single regulatory mechanism has been proposed for all RCK-regulated channels, involving signal transduction from the RCK domain to the gating area. Here, we present an inactive ADP-bound structure of KtrAB from Vibrio alginolyticus, determined by cryo-electron microscopy, which, combined with EPR spectroscopy and molecular dynamics simulations, uncovers a novel regulatory mechanism for ligand-induced action at a distance. 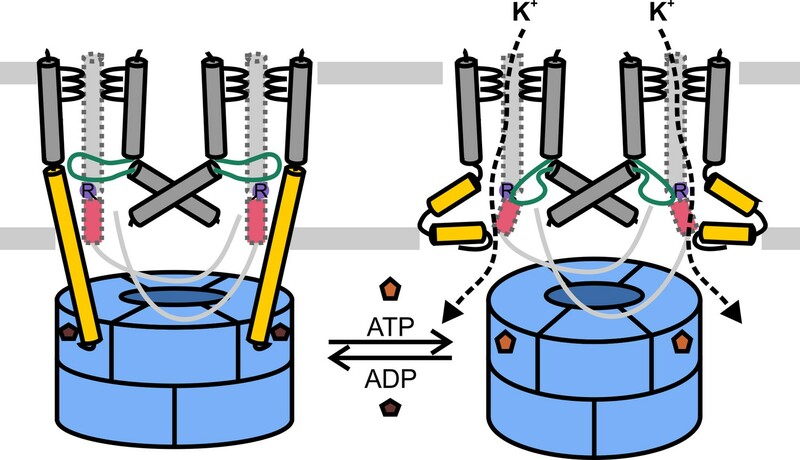 Exchange of activating ATP to inactivating ADP triggers short helical segments in the K+-translocating KtrB dimer to organize into two long helices that penetrate deeply into the regulatory RCK domains, thus connecting nucleotide-binding sites and ion gates. As KtrAB and its homolog TrkAH have been implicated as bacterial pathogenicity factors, the discovery of this functionally relevant inactive conformation may advance structure-guided drug development. Potassium ions (K+) are the main cations in living cells from all kingdoms of life. Within the cell, the K+ concentration is responsible for a plethora of tasks, including pH homeostasis (Bakker and Mangerich, 1981; Kroll and Booth, 1981; Plack and Rosen, 1980), cell growth, maintenance of osmolarity and cell volume (Schultz et al., 1963), movement and electrical signaling (Hille, 2001). Consequently, K+ translocation across the membrane is a highly regulated process, facilitated by integral membrane proteins. The majority of the prokaryotic ligand-gated K+ channels and many eukaryotic systems consist of a single tetrameric pore regulated by covalently linked cytoplasmic ligand-binding domains, termed regulator of K+ conductance (RCK) (Jiang et al., 2001, 2002b). Based on the structural knowledge of various K+ uptake systems, a three-stage regulatory mechanism via the RCK domains has been proposed (Chakrapani and Perozo, 2007; Hite et al., 2015; Jiang et al., 2002a, 2002b; Ye et al., 2006; Yuan et al., 2011). Initially, binding of a ligand to the RCK domains induces a conformational change. This rearrangement triggers the movement of flexible linkers that connect the RCK domains with the C-termini of the pore domains. The third step is initialized by the altered flexibility of the linkers, which translates the mechanical signal into an opening of the gating region, the so-called helical bundle. Finally, the open ion pathway allows free flow of K+. In contrast to the aforementioned K+ channels, the pore subunits (KtrB/TrkH) of the osmoprotective systems Ktr and Trk merely interact with the cytoplasmic RCK subunits (KtrA/TrkA), missing the covalent helical linkage (Cao et al., 2013; Vieira-Pires et al., 2013). Furthermore, instead of a single pore, two neighboring pores are regulated by one octameric ring of RCK subunits (Albright et al., 2006). Hence, an adapted regulatory mechanism is required taking these distinct structural features of the Ktr and Trk systems into consideration (Albright et al., 2007; Cao et al., 2011). Ktr and Trk systems exhibit a very similar structure. Each KtrB and TrkH monomer consists of four pairs of covalently linked transmembrane helices (D1-D4) that surround the ion pathway and together constitute the pore (Figure 1A,B). The two transmembrane helices M1 and M2 of each repeat are joined by pore loops (P loops), which form the selectivity filter (Cao et al., 2013; Durell and Guy, 1999; Vieira-Pires et al., 2013). Compared to the TVGYG motif of classical K+ channels, the selectivity filter of KtrB and TrkH is less conserved (Zhou et al., 2001); a single glycine residue of each of the four P loops converges within the ion pathway (Figure 1) (Tholema et al., 1999, 2005). An intramembrane loop formed by the central part of broken D3M2 directly beneath the selectivity filter represents a unique structural motif that regulates K+ flow by blocking and opening of the pore. The intramembrane loop (Hänelt et al., 2010a, 2010b) together with a highly conserved arginine residue in D4M2 (Cao et al., 2011) forms the molecular gate (cf. Figure 1C). Regulation of the pore subunits, KtrB and TrkH, is thought to occur via nucleotide-dependent conformational changes of the octameric RCK subunits (Cao et al., 2013; Kröning et al., 2007; Szollosi et al., 2016; Vieira-Pires et al., 2013). X-ray structures revealed distinct ATP- or ADP-induced conformational changes within the RCK ring, whereas the pore conformation was almost identical (Szollosi et al., 2016; Vieira-Pires et al., 2013). However, the link between conformational changes within the RCK subunits and pore permeability remained elusive. Overview of the KtrB subunit. Topology diagram of KtrB subunit structure in the presence of ADP (A) and ATP (B). (C) Amino acid sequence alignment of different KtrBs using Clustal Omega and GeneDoc and secondary structure of VaKtrB in the presence of ADP. α-helices and β-strands are shown as rectangles and arrows, respectively. Sequence conservation color-coded: White on red, 100%; black on orange, ≥80%; black on yellow, ≥60%. SF = selectivity filter. Discussed motifs are highlighted: intramembrane loop is colored in green, D1M2b helix and tip helix in yellow, D4M2b helix in magenta and the conserved arginine in purple. Asterisks (*) mark conserved gating hinge glycine residues. Here, we present a cryo-electron microscopy (cryo-EM)-based structural model of ADP-bound KtrAB, combined with pulsed electron paramagnetic resonance (EPR) measurements and molecular dynamics (MD) simulations. Our data reveal the direct regulation of the pore subunits by ligand-induced conformational changes within the octameric RCK ring. The proposed new regulatory mechanism for Ktr/Trk exerts control over the two neighboring pores and represents a surprising variation to the three-stage regulatory mechanism observed in single-pore RCK channels. 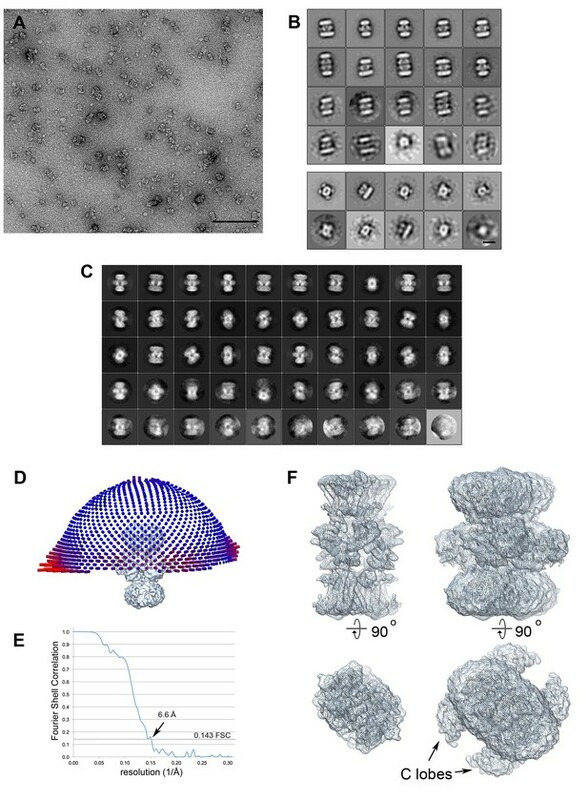 To obtain a cryo-EM map of ADP-bound KtrAB, full-length KtrAB from Vibrio alginolyticus was heterologously produced in Escherichia coli. The detergent-solubilized complex used for cryo-EM data collection was shown to bind ADP and ATP with low micromolar affinities (Figure 2). A total of 20,500 particle images of ADP-bound KtrAB were combined to generate a cryo-EM map at an overall resolution of 6.6 Å with D2 symmetry imposed (Figures 3A and 4). The density map displays an octameric ring of KtrAs, associated on both sides with a KtrB dimer in a detergent belt (Figure 3A,B). This KtrB2A8B2 composition was confirmed by negative stain EM of the detergent-solubilized complex and native mass spectrometry (Figure 4A,B and Figure 4—figure supplement 1). This assembly, also observed in crystal structures of KtrAB and TrkAH homologs (Cao et al., 2013; Vieira-Pires et al., 2013), is probably formed during protein purification due to the symmetry of the octameric KtrA ring, which has identical binding sites for the KtrB dimer on both sides. The C-terminal domains of KtrA, the so-called C lobes at the periphery of the KtrA ring, are poorly resolved, indicating an increased flexibility of these areas (Figure 4F). The KtrA ring has an oval shape (Figure 5C), as has been described for the homologous proteins within the complex (Cao et al., 2013), as well as for the solitary KtrA ring in the presence of ADP (Albright et al., 2006). A remarkable feature of the KtrAB map, which has not previously been observed, is an elongated density protruding from each KtrB monomer into the octameric KtrA ring (Figure 3A,B). In contrast, no densities are visible for D1M2b and the tip helix, which form a helix hairpin at the membrane surface in the ATP-bound structure (cf. Figure 5A,B), suggesting large nucleotide-dependent conformational changes in this region. We constructed a model of ADP-bound KtrAB by flexibly fitting a homology model of KtrAB of V. alginolyticus in the ATP-bound conformation (based on the corresponding X-ray structure of KtrAB from Bacillus subtilis [Vieira-Pires et al., 2013]) into the EM map (Figure 3C). The most prominent feature in the ADP-bound KtrAB model is a subunit-interconnecting helix, 58 Å in length, which spans the entire membrane and protrudes into the KtrA ring (Figures 3C and 5A). This helix is an extension of helix D1M2, which in the ATP-bound structure is ~28 Å long. The adjacent C-terminal helix D4M2b is extended by 18 Å (3.3 helical turns) in the ADP-bound conformation compared to the ATP-bound state and also spans the entire membrane (cf. Figure 5A,B). These major conformational changes in D1M2 and D4M2 together obviously narrow the pores in the ADP-bound conformation (Figure 5A,B). Apart from these significant changes, the overall structure of the membrane part of the ADP-bound model resembles the corresponding conformation of KtrAB in its ATP-bound form (cf. Figure 6A,B, Video 1). Similar to the ATP-bound conformation, the KtrB protomers interact with each other via their C-termini; each terminus extends into the cytoplasmic cavity of the neighboring protomer and in addition forms a lateral contact with the octameric ring of KtrA (Figure 3C). Binding of KtrAB to nucleotides examined by ITC measurements. Upper panels: raw heat exchange data, associated with (A) ADP or (B) ATP binding to detergent-solubilized KtrAB. Lower panel: integrated injection heat pulses, normalized per mole of injection, reveal differential binding curves calculated by a one-site binding model with determined Kd values of 3 μM for ADP and 2 μM for ATP. Three-dimensional reconstruction of ADP-bound KtrAB. (A) Side view of the cryo-EM map colored by protein subunits. (B) 90° rotated side view of the density map cut open to highlight the extended helices. (C) Structural model of ADP-bound KtrAB in the same orientation as in A. KtrBs, dark and light grey with helices D1M2, yellow; octameric ring of KtrA, dark and light blue; ADP in rosy brown. (A) KtrAB negatively stained with uranyl acetate. The scale bar is 100 nm. (B) Class averages from negatively stained particles. The top panel shows classes from a data set of ~1600 large particles. Most classes show a KtrB2A8B2 arrangement, a few are KtrB2A8A8B2 complexes. The lower panel shows a classification of ~500 small particles. Most classes show an elliptic top view with four KtrA C-terminal dimers; two classes show a side view of a KtrAB complex. Scale bar: 10 nm. (C) 2D class averages of the final cryo-EM data set of 20,500 particles. The classes show different views of the complex, many with high-resolution detail. (D) The final cryo-EM density map with the orientation distribution. The length of each cylinder represents the number of particles viewed from that direction. Although the particles have preferred orientations (long red cylinders), there are no missing orientations. (E) Fourier Shell Correlation curve indicating a resolution of 6.6 Å using the 0.143 criterion (dotted line). (F) Top view and side view of the density map with high (left) and low (right) contour level. At low contour level, the detergent micelle around KtrB and the characteristic peripheral C lobes around the octameric KtrA ring are visible. Nucleotide-induced conformational changes of the KtrAB complex. Overlay of the KtrAB density map in the presence of ADP with KtrAB model in the presence of (A) ADP and (B) ATP. 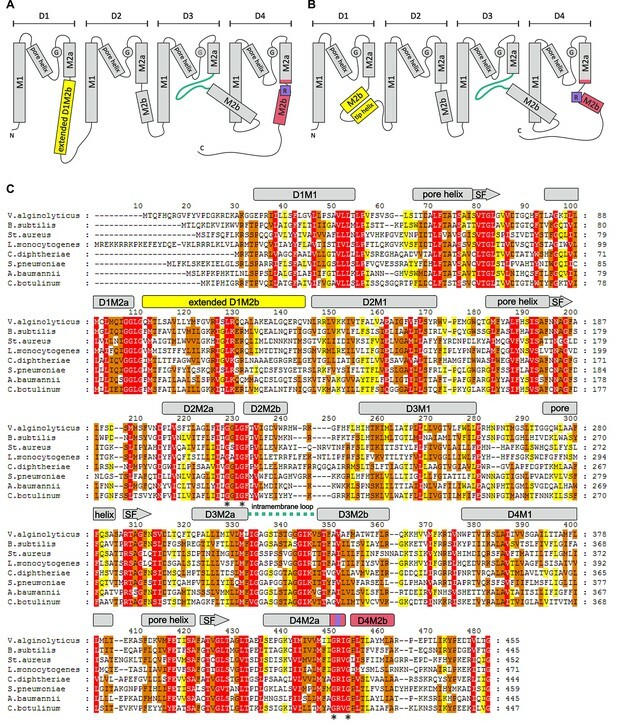 KtrB subunits are depicted in light and dark grey, D1M2b helices in yellow, D4M2 helices in magenta, and RCK domains in blue. (C), (D) Top and side views of overlays of the density map with the ADP-bound KtrB model and the ADP- (C) or the ATP-bound (D) model of KtrA. KtrBs, grey and light grey with helices D1M2b, yellow; octameric ring of KtrA, blue and light blue; ADP, rosy brown; ATP, tan. Red arrows indicate steric hindrance of helix D1M2 with the ATP-bound KtrA. (E) Pulsed EPR data of spin-labeled variant KtrAB A122CR1 in detergent solution recorded at Q band (34 GHz). Dipolar evolution functions and the corresponding interprotomer distances obtained by Tikhonov regularization were determined in the presence of ADP (rosy brown) and ATP (blue), respectively. Dashed lines represent the predicted distance distributions of the ADP- and ATP- bound models, respectively, using the rotamer library analysis (Polyhach et al., 2011). Gating mechanism of the KtrAB complex. (A), (B) Side views of one gating region of the KtrAB complex in the ADP- (A) and ATP-bound (B) conformation with helices at the front removed. KtrBs, grey and light grey with helices D1M2b, yellow and D4M2b, magenta; octameric ring of KtrA, blue and light blue; intramembrane loop, green; R427, purple. (C) Number of water molecules in the cavity below the gating region during MD simulations in the ADP-bound (rosy brown; simulation code: ABDGVA+ABDNVA) and ATP-bound states (blue; simulation code: ABTGVA+ABTNVA). For reference, averaged hydration numbers are shown from 10 additional simulations each in the ADP-bound (green; simulation code: ABDGBVA) and ATP-bound states (purple; simulation code: ABTGBVA), starting from structures in which the intramembrane loop was modeled blindly. The lower end of the cavity volume was consistently defined by a plane passing through the lipid head groups. (D) Pulsed EPR data of spin-labeled variant KtrAB T318CR1 reconstituted in liposomes recorded at Q band (34 GHz). Dipolar evolution functions and the corresponding interprotomer distances obtained by Tikhonov regularization were determined in the presence of internal ADP (rosy brown) and in the presence of internal ATP and external K+ (blue), respectively. 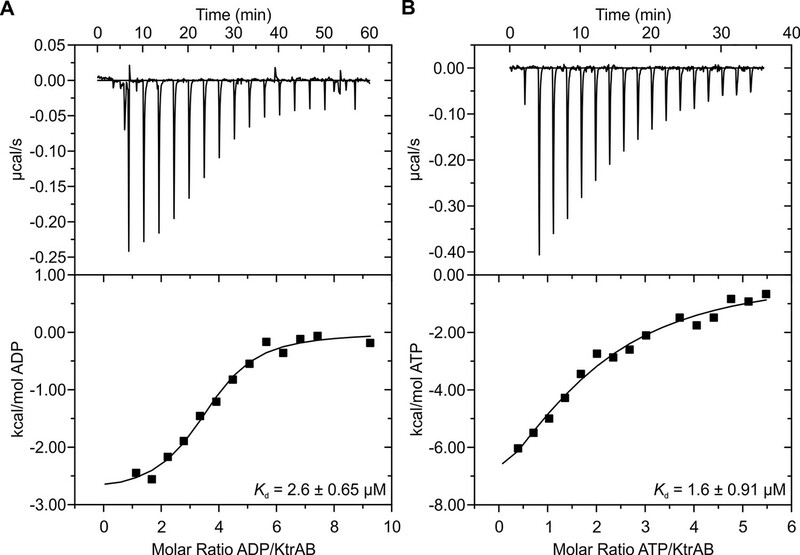 Conformational differences between the ADP- and ATP-bound KtrAB complex. Linear morph between the ADP- and ATP-bound KtrAB models providing a visual aid for the undergone conformational changes shown in Figure 6. Subunits and structural features are colored according to Figure 6. A comparison of the ADP- and ATP-bound structural models allows us to further analyze the newly identified coupling helix D1M2 that connects cytoplasmic KtrA with membrane-embedded KtrB and probably is a key feature for the regulation of Ktr. In the ADP-bound conformation, D1M2 forms one continuous, elongated α-helix that reaches into the octameric KtrA ring, probably enabling direct interactions with nearby residues close to the ADP-binding sites (Figure 5C). An overlay of the KtrB subunits in the ADP-bound state and the KtrA ring in its ATP-bound conformation implies that this extended α-helix is unlikely to form in the presence of ATP, due to steric hindrance (Figure 5D). In the crystallized ATP-bound conformation, D1M2 is twice broken, forming a short transmembrane α-helix with a C-terminal helix hairpin extending to the cytoplasmic membrane surface (Figures 5B and 6B). The ADP- and ATP-bound structural models (Cao et al., 2013; Vieira-Pires et al., 2013) reveal that ATP interacts with two different KtrAs via its γ-phosphate group, whereas ADP interaction occurs within one subunit. These disparate interactions of the nucleotides allow the diamond-shaped conformation of the RCK domain in the ADP-bound state in presence of the elongated D1M2 helix, whereas the square-shaped ATP-bound state excludes the straightening of the α-helix by steric hindrance (cf. Figure 5C,D). In order to confirm the nucleotide-induced conformational rearrangement of the D1M2 region, we used pulsed EPR measurements on the detergent-solubilized, spin-labeled KtrAB complex. Based on a MMM evaluation (Polyhach et al., 2011) of the different positions within our models’ D1M2 region, we selected the position that potentially undergoes the largest nucleotide-regulated conformational changes. Thus, we introduced a single cysteine into a Cys-less KtrAB variant at position A122 in KtrB (Figure 5—figure supplement 1A). The functionality of the mutant was confirmed by a growth complementation assay at limiting K+ concentrations (Figure 5—figure supplement 1B). Taking our model of the ADP-bound KtrB2A8B2 complex into account, the presence of four KtrB protomers results in three distinct distance contributions. Therefore, a relatively broad total distance distribution in the range of 2 to 5 nm was predicted, reflecting the distances between four spin-labeled residues A122C within a single KtrB2A8B2 complex (Figure 5E, dashed rosy brown line, Figure 5—figure supplement 2, upper panel). In comparison, the model of the ATP-bound KtrB2A8B2 complex led us to predict a shift to longer interspin distances of 6 to 10 nm (Figure 5E, dashed blue line, Figure 5—figure supplement 2, lower panel). Indeed, the slow decline of the dipolar evolution functions in the presence of ATP indicates long distances, which according to the Tikhonov regularization center around 5.3 nm (Figure 5E, Figure 5—figure supplement 3). The shift to longer distances becomes more pronounced with increasing ATP concentrations. In analogy to the measurements in the presence of ATP, the experimentally determined dipolar evolution functions in the presence of ADP show a fast decay with poor oscillations, which correspond to broad distance distributions centered around 3.0 nm (Figure 5E, Figure 5—figure supplement 3). An increased ADP concentration results in a pronounced and fast decay, indicating an increased population at short distances. The distance distribution obtained in the presence of a high ADP concentration is in good agreement with the interspin distances predicted for the elongated helices. In both ATP conditions, the experimentally determined mean distances are shorter than the model-based, calculated data. However, the experimentally determined mean distances for the ATP-bound model are significantly longer compared to the model in the presence of ADP. The decrease in experimentally determined mean distance, compared to the one predicted for the ATP-bound model, is presumably caused by the limited dipolar evolution time (de Vera et al., 2013; Jeschke et al., 2006). The experimentally determined mean distances would likely increase with a prolonged d2 time. Additionally, the D1M2 region could of cause adopt a slightly different conformation than given in the ATP-bound model, which could result in slightly shorter distances. In summary, the measurements reflect the nucleotide-dependent conformational change of the D1M2 region between the formation of the helix hairpins (in the presence of ATP) and elongated helix (in the presence of ADP). In the absence of nucleotides, the dipolar evolution function represents an intermediate between the two functions in the presence of ADP and ATP, respectively. This results in a distance distribution between 2 and 6 nm, with an equal probability of contributions from both conformations (Figure 5—figure supplement 3). Taken together, the analysis of our EPR data reveals for the first time a significant nucleotide-dependent movement of the D1M2 region of the K+-translocating subunit KtrB and suggests a concentration-dependent equilibrium between the two states. Previous in vivo and in vitro studies have demonstrated the activating effect of ATP on Ktr and Trk systems, while ADP was hypothesized to act as an inactivating factor (Cao et al., 2013; Kröning et al., 2007; Vieira-Pires et al., 2013). Thus, nucleotide-induced conformational changes in KtrA should affect the gating region of KtrB. The molecular gate in KtrB is thought to be formed by the intramembrane loop located just below the selectivity filter and a highly conserved arginine residue (R427 in VaKtrAB) in D4M2 situated in the same plane (Figure 6A,B and Figure 1C) (Cao et al., 2011, 2013; Hänelt et al., 2010a, 2010b). Interestingly, also the kinks in α-helices D1M2 and D4M2 introduced by the conformational change from the ADP- to the ATP-bound state are located in this region (Figure 6A,B). The kink in D4M2 may even directly reorient the gating arginine residue (R427) and move it away from the intramembrane loop as it is contained within the altered part of D4M2. Remarkably, the proposed gating region is also marked by a glycine-rich ring (Figure 1C, Figure 6—figure supplement 1), which in other K+ channels is linked to the gating region and is referred to as glycine hinge (Jiang et al., 2002a). The essential aspect for the facilitation of the K+ flux is the accessibility and the opening of the gate, which we have previously described as the movement of the intramembrane loop (Hänelt et al., 2010a, 2010b). However, the resolution of our density map is not high enough to draw detailed conclusions on the conformation of the gate. Instead, MD simulations demonstrate that in the ADP-bound conformation, α-helices D1M2 and D4M2 interact with the gating motifs in KtrB and hinder water accessibility. In the presence of ATP, the number of water molecules in the cavity below the gating region increases due to the discontinuous structure of D1M2 and D4M2, making the gate accessible to water from the cytoplasmic side (Figure 6C, Figure 6—figure supplement 2). To explore the role of the intramembrane loop in water accessibility, we performed additional simulations of 10 ADP- and ATP-bound structural models each, in which this loop was modeled blindly (see Materials and methods). Results for the water accessibility in the ADP- and ATP-bound states agree with those of the original simulations. Within the model uncertainties, the conformation of the loop thus has a minimal effect on the hydration level of the gating region (Figure 6C). Therefore, the water accessibility of the gating region is mainly dependent on the D1M2 and D4M2 conformations. For K+ translocation, the increased water accessibility should be accompanied by the opening of the molecular gate. To directly determine nucleotide-dependent conformational changes in the gating region, we performed pulsed EPR measurements on KtrB and KtrAB variants with spin-labeled intramembrane loop residue T318CR1 (Figure 5—figure supplement 1A. The mutants’ functionality again was confirmed using the complementation assay (Figure 5—figure supplement 1B). Since the movement of the intramembrane loop in KtrB alone has been previously shown to depend on a K+ gradient and/or the lipid environment (Hänelt et al., 2010b), spin-labeled variants were initially reconstituted into liposomes. In the absence of the KtrA subunits, the intermolecular distances between residues T318CR1 in the KtrB dimer display a broad distance distribution both in the absence and presence of the K+ gradient (Figure 6—figure supplement 3A), indicating the high flexibility of the intramembrane loop independent of a K+ gradient. The addition of external K+ induces no significant change of the interspin distance distribution. In contrast, in the presence of KtrA and upon the inclusion of ADP inside the liposomal lumen, the recorded pulsed EPR spectrum shows a defined oscillation, which marks a narrow distance distribution centered around 3.3 nm. This narrow distance distribution reflects the immobilization of the intramembrane loop (Figure 6D, Figure 6—figure supplement 3B). However, in the presence of ATP inside the liposomes and upon the external addition of K+, the oscillation of the spectrum becomes less defined, demonstrating a broader distance distribution and thus the movement of the intramembrane loop. Furthermore, the mean distance is shifted toward longer distances, suggesting an increased probability of an open conformation for facilitation of the flux of potassium ions (Figure 6D, Figure 6—figure supplement 3B). To examine the effect of nucleotides on the gating region only, we repeated the measurements on spin-labeled KtrAB variant T318C in a detergent environment (Figure 6—figure supplement 3C,D). Two different d2 times of 2 and 3 µs, respectively, were recorded to appropriately determine short and long distances. A narrow distance distribution of 3.5 nm was observed in the presence of ADP, representing a similar but slightly shifted mean distance distribution compared to the proteoliposome measurements. In the presence of ATP, the defined oscillation in the dipolar evolution function diminishes and the corresponding distance distribution significantly broadens. In comparison to the ATP-bound measurements in proteoliposomes the distance distributions are even broader, indicating an increased flexibility of the intramembrane loop in the detergent-solubilized sample. In summary, this set of measurements demonstrates that in the ADP-bound conformation of the KtrAB complex with its elongated α-helices D1M2 and D4M2, the molecular gate is stabilized in its inactivated, closed conformation. In contrast, the binding of ATP likely unlocks the intramembrane loop and enables the stochastic movement of the gate. In fact, MD simulations on the KtrB subunit of the ATP-bound X-ray structure of KtrAB from B. subtilis (Vieira-Pires et al., 2013) confirm the flexibility of the intramembrane loop in this conformation (Figure 6—figure supplement 4). Conformational changes from a closed state, which blocks the pore, to an open state, which allows water to access the selectivity filter, are enabled (Figure 6—figure supplement 2). Finally, as supported by the comparison of samples in detergent solution and liposomes, a K+ gradient, the surrounding membrane and/or other factors yet to be identified are needed to stabilize the active, open conformation. Further structural investigations are required to resolve a molecular model of an open, active state. This study presents, to the best of our knowledge, the first data on how gating in KtrB, and by extrapolation in TrkH, is regulated by nucleotide binding to the cytoplasmic RCK ring. 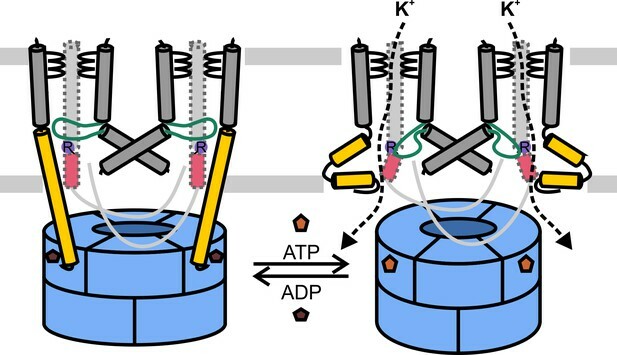 Our results lead us to the proposal of an activation mechanism: Under non-activating conditions, ADP is bound to the RCK subunits in a conformation with extended α-helices D1M2, which are stabilized by specific, not yet identified interactions between KtrA and KtrB similar to a spring tension state. At the gating regions of KtrB α-helices D1M2 and D4M2 probably form stable interactions with the conserved arginine residue and/or residues of the intramembrane loop. These interactions lock the gate in its rigid, closed conformation. Upon a hyperosmotic shock the internal ATP concentration increases (Ohwada and Sagisaka, 1987; Ohwada et al., 1994), which leads to the replacement of ADP by ATP in a competitive manner. ATP binding then induces the conformational change of the octameric KtrA ring (Albright et al., 2006) resulting in the formation of helix hairpins of D1M2 at the membrane surface and partial unfolding of D4M2. The protein is in its activated state; hence, the gating region is unlocked, enabling conformational changes of the intramembrane loop within the pore, which in principle allows K+ ions to translocate (Figure 7). However, instead of stochastic opening events which are enabled by the unlocking of the gating region, patch-clamp measurements on TrkAH (Cao et al., 2013) and whole-cell K+ uptake studies on KtrAB (Tholema et al., 1999) suggest prolonged opening probabilities in the presence of ATP, such that additional factors are required to stabilize the active, open state. Lipids, for instance, may play an essential role in the regulatory process and their role should be further investigated. Furthermore, Na+ ions (Tholema et al., 1999) and protons (Stumpe et al., 1996) have been previously described to activate the KtrAB and TrkAH systems, respectively, but their molecular role is not yet understood. In order to validate and detail the model, further research and high-resolution structures are needed. A high-resolution structure of the activated, open state would unravel the precise interactions that stabilize the open gate, and provide insights into the interplay between the permeant ion and the gate. Similarly, a high-resolution structure of the ADP-bound, inactive state would elucidate direct interactions between the KtrA subunits and the extended helices, as well as between the extended helices and the gating region. On a functional level it remains puzzling how the ratio of ATP to ADP determines the protein’s activity under physiological conditions since in general an excess of ATP over ADP is assumed (Corrigan and Gründling, 2013; Kim et al., 2015). The numbers given in the literature, however, do not discriminate concentrations of free versus bound molecules, which could change the ratio significantly toward ADP. Additionally, recent data suggest another level of regulation by the binding of cyclic nucleotides to the C lobes of KtrA, which likely plays an additional role for the inactivation of the system (Kim et al., 2015). Yet, the resetting mechanism of KtrAB into its closed, inactivated state remains to be identified. One possible explanation is that the surrounding membrane provides the activation energy needed for this conformational change. This hypothesis seems plausible knowing that the lipid composition is adjusted upon a hyperosmotic shock (Romantsov et al., 2009). The deactivation of the KtrAB system might be coordinated with the activation of compatible solute transporters, which were shown to be activated by the altered lipid composition (Culham et al., 2003; Peter et al., 1996; Rübenhagen et al., 2000; Schiller et al., 2006; van der Heide et al., 2001). Future structural and functional studies are needed to shed light on this deactivating mechanism. Cartoons showing the ADP- and ATP-bound conformations. With ADP bound, the extended helices D1M2b of KtrB dimers interact with residues in KtrAs close to the ADP binding sites, and with the gating regions of KtrBs. The gates are locked in the closed conformation. In the presence of ATP, the D1M2 helices break, forming helix hairpins at the membrane surface, and helices D4M2b move away from the pore. The disruption of interactions in the gating regions allows the intramembrane loops to move. In general, K+ flux is enabled. KtrAs, blue; KtrBs, grey with helices D1M2b, yellow; helices D4M2b, magenta; intramembrane loop, green, and conserved arginine, purple; ADP, dark brown; ATP, light brown. A three-stage translocation mechanism has been suggested previously for a variety of different single-pore RCK channels (Hite et al., 2015; Jiang et al., 2002b; Kong et al., 2012) (Figure 8). This translocation mechanism implies that ligand-induced conformational changes in the RCK domain are transferred via a flexible linker to the helical bundle of the pore domain. Our data suggest an unexpected, new mechanism of regulation for the Ktr/Trk family. The unique features of this family, namely the existence of two parallel pores and the non-covalent association of cytoplasmic RCK subunits require a modified regulation mechanism. The functions of the flexible linker and the helical bundle are transferred to the movement of the elongated helices and their interactions with the gating regions. This new understanding of the general mechanism of regulation provides the starting point for further investigations into the functional role of the two parallel pores in comparison to single-pore channels. Comparison of proteins regulated by RCK domains. Side views of KcsA (PDB code 3EFF [Uysal et al., 2009]), MthK (PDB code 1LNQ [Jiang et al., 2002b]), Slo2 (PDB code 5A6E [Hite et al., 2015]), GsuK (PDB code 4GX1 [Kong et al., 2012]) and ADP-bound KtrAB. 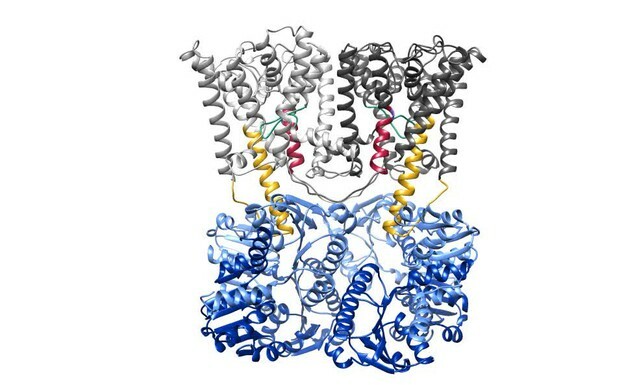 Membrane domains/protomers, grey; flexible linker or extended helices, yellow; octameric RCK domains/protomers, blue. The grey bar represents the membrane. Ktr/Trk systems are key players for the homeostasis of bacterial cell physiology, encasing osmotic resistance, cellular fitness during host infection (Alkhuder et al., 2010; Stingl et al., 2007) and antimicrobial resistance (Diskowski et al., 2015; Gries et al., 2013; Su et al., 2009). Ktr/Trk systems are essential for bacteria but not present in mammalian cells. Therefore, the newly discovered inactive conformation may be a suitable target for structure-guided drug development of an entirely new line of antibiotics. The ktrA and ktrB genes were amplified from Vibrio alginolyticus genomic DNA and cloned into the pBAD18 plasmid (Guzman et al., 1995). His10-ktrAB, ktrB-His6 and derivates were overexpressed with 0.02% L-arabinose in Escherichia coli LB2003 (Stumpe and Bakker, 1997) in K3 minimal media (Epstein and Kim, 1971; Stumpe and Bakker, 1997; Tholema et al., 2005) (with 100 mg/l ampicillin and 0.2% glycerol) aerobically at 37°C for 7 hr. For protein purification, cells were lysed by sonication in Buffer A (140 mM NaCl, 60 mM KCl, 20 mM Tris-HCl pH 8.0), the membranes were solubilized with 1% n-dodecyl-ß-D-maltoside (DDM) (>99% highly purified, GLYCON Biochemicals GmbH, Germany) for 1 hr at 4°C. Spin-cleared lysate was loaded onto a Ni-NTA Agarose affinity resin (Qiagen, Germany) supplemented with 10 mM imidazole. Nonspecifically bound proteins were removed with Buffer A containing 1.5 mM Cymal-6 (Anatrace, Maumee, Ohio) and 50 mM imidazole. The KtrAB complex was eluted with Buffer A containing 1.5 mM Cymal-6 and 500 mM imidazole and subjected to size-exclusion chromatography with a Superdex 200 Increase 10/300 GL column (GE Healthcare Life Sciences, Chicago, Illinois) pre-equilibrated with Buffer A containing 1.5 mM Cymal-6. For cryo-EM, the KtrAB complex was introduced via Desalting Columns (7K MWCO Thermo Fisher Scientific, Waltham, Massachusetts) to Buffer B (70 mM NaCl, 30 mM KCl, 20 mM Tris-HCl pH 8.0, 1.5 mM Cymal-6, 600 µM ADP) and finally concentrated via Centrifugal Filters (Amicon Ultra 0.5 ml MWCO 100 Merck Millipore Ltd, Billerica, Massachusetts) to 5 mg/ml. Binding affinity measurements on the detergent-solubilized protein were performed on a MicroCal 200 ITC (MicroCal. Malvern, United Kingdom). 150 µl of the protein sample in Buffer A with a concentration of 8 µM were introduced into the sample cell. For the titration, the same Buffer A containing 275 µM ATP or 600 µM ADP was loaded into the injection syringe. The system was equilibrated to 25°C with a stirring speed of 750 rpm. Titration was initiated by 0.5 µl-injection, followed by 2 µl-injections every 200–250 s. In total 17 single injections were performed. Background corrections were performed by the titration of the titration solution to Buffer A, using the same experimental setup. The evaluation was performed using ORIGIN7, excluding the first injection peak. Three microliter of His10-KtrAB sample at a concentration of 5 mg/ml in the presence of 600 µM ADP was applied to freshly glow-discharged C-flat multi-hole carbon grids (CF-MH-4C multi C-Flat, ProtoChips, Morrisville, North Carolina) and vitrified using a Vitrobot (FEI, Hillsboro, Oregon) at 70% humidity with 10 s blotting time at 10°C. Cryo-EM images were recorded on an in-column energy-filtered JEOL 3200 FSC electron microscope with a Gatan K2 direct detector. Images were collected at a nominal magnification of 20,000x, corresponding to a calibrated pixel size of 1.63 Å, at 1.5–2.5 μm defocus in movie mode. Dose-fractionated 8 s movies of 40 frames with a total electron dose of 27 electrons per Å2 were recorded. Global beam-induced motion was corrected by movie frame processing (Li et al., 2013). 35,400 particles were selected from 800 micrographs. 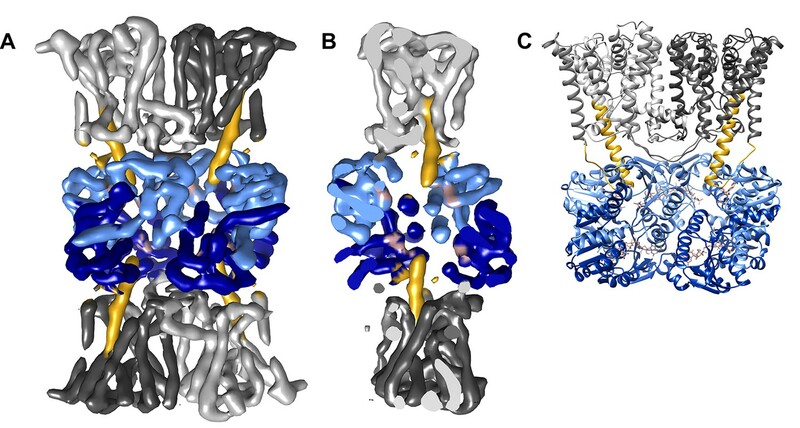 A model calculated from the X-ray structure of ATP-bound KtrAB (PDB code 4J7C [Vieira-Pires et al., 2013]) low-pass filtered to 60 Å was used as initial model for refinement. 3D map refinement and 2D and 3D classification was carried out with RELION 1.3 (Scheres, 2012). The final model from 20,500 particles had a resolution of 6.6 Å. Three microliter of a detergent solubilized KtrAB sample at a concentration of 10 µM in Buffer D (25 mM NaCl, 15 mM KCl, 20 mM Tris-HCl pH 8.0 and 1.5 mM Cymal-6) was used for mass spectrometry (MS). The measurements were performed on a homebuilt reflectron-time-of-flight (TOF) setup as published in detail (Morgner et al., 2007). MS spectra show averaged signals between 500 to 1000 droplets. For site-directed spin-labeling, the spin-cleared lysate was bound to the Ni-NTA Agarose affinity resin in the presence of 5 mM β-mercaptoethanol and 10 mM imidazole. The first washing step was carried out with degassed Buffer A containing 50 mM imidazole and 1.5 mM Cymal-6 for variant KtrAB A122C, or 0.04% DDM for variant KtrB T318C and variant KtrAB T318C. Protein was labeled overnight at 4°C with 1 mM (1-oxyl-2,2,5,5- tetramethylpyrrolidin-3-yl)methylmethanethiosulfonate spin label (MTSSL) (Toronto Research Chemicals, Inc., Canada) in Buffer A containing the respective detergents. To remove free spin label, the Ni-NTA Agarose affinity resin was washed with degassed Buffer A containing the respective detergent. The protein was eluted with Buffer A containing 500 mM imidazole and detergent. Subsequently, the protein was further purified by size-exclusion chromatography in combination with a pre-equilibrated Superdex 200 Increase 10/300 GL column (GE Healthcare Life Sciences) in Buffer A with the respective detergent. For the EPR measurements, the protein was either subjected to reconstitution into liposomes or for the detergent-solubilized samples concentrated via Centrifugal Filters (Amicon Ultra 0.5 ml MWCO 100 Merck Millipore Ltd) to 10 mg/ml and supplemented with 14% deuterated glycerol (v/v) (Sigma, St. Louis, Missouri) and indicated ATP and ADP concentrations, respectively. Spin-labeled proteins were reconstituted into liposomes containing E. coli polar lipids (prepared from Avanti total lipid extract) and egg yolk L-α-phosphatidylcholine (Sigma) in a 1:10 protein to lipid ratio (w/w). Liposomes were prepared as described before in a 3 + 1 (w/w) ratio (Hänelt et al., 2010b) containing 1 mM ATP and ADP, respectively, as indicated. The liposomes were diluted with Buffer C (200 mM Choline-Cl, 20 mM Tris-HCl pH 8.0) to 4 mg/ml and titrated with Triton X-100 (Sigma). The detergent-destabilized liposomes were mixed with spin-labeled protein and incubated for 30 min at room temperature under gentle agitation. Polystyrene beads (Biobeads SM2) were added at a wet weight of 40 mg/ml, and the sample was incubated for further 15 min at room temperature. Subsequently, fresh Biobeads SM2 (40 mg/ml) were added four times with incubations at 4°C of 15 min, 30 min, overnight, and 1 hr, respectively. The beads were removed, and the mixture was diluted threefold with Buffer C. After collecting the proteoliposomes by ultracentrifugation, they were washed twice with buffer C. Finally, the proteoliposomes were dissolved in buffer C and supplemented with 14% deuterated glycerol (v/v) (Sigma) and when indicated with 100 mM KCl for further pulsed EPR experiments. For pulsed EPR measurements recorded at X band (9.4 GHz), 30–40 μl of the sample was loaded into EPR quartz tubes with a 3 mm outer diameter and shock frozen in liquid nitrogen. The experiments were performed at 50 K on an Elexsys 580 spectrometer (Bruker, Billerica, Massachusetts). Temperature was controlled by the utilization of a continuous-flow helium cryostat (Oxford Instruments, United Kingdoms) and a temperature controller (Oxford Instruments). The four-pulse DEER sequence was applied (Pannier et al., 2011). The previously established parameters (Hänelt et al., 2010b) were kept unmodified with observer pulses of 16–32 ns and a pump pulse of 12 ns. The frequency of the pump pulse was set to the maximum of the nitroxide EPR spectrum and the frequency separation to 65 MHz. For pulsed EPR measurements recorded at 50K and at Q band (34 GHz), 15 μl of the sample was placed into EPR quartz tubes with a 1.6 mm outer diameter and shock frozen in liquid nitrogen. The four-pulse DEER sequence was applied with observer pulses of 32 ns and a pump pulse of 20 ns. The frequency separation was set to 50 MHz and the frequency of the pump pulse to the maximum of the nitroxide EPR spectrum. Validation of the distance distributions were performed by means of the validation tool included in DeerAnalysis (Jeschke et al., 2006). Here, the parameters Background start and Background density were varied in the suggested range by applying fine grid resulting in 121 trials. Afterwards, poor fits were excluded by using a prune level of 1.15. Moreover, interspin distance prediction was performed using the rotamer library approach included in the MMM software package (Polyhach et al., 2011). 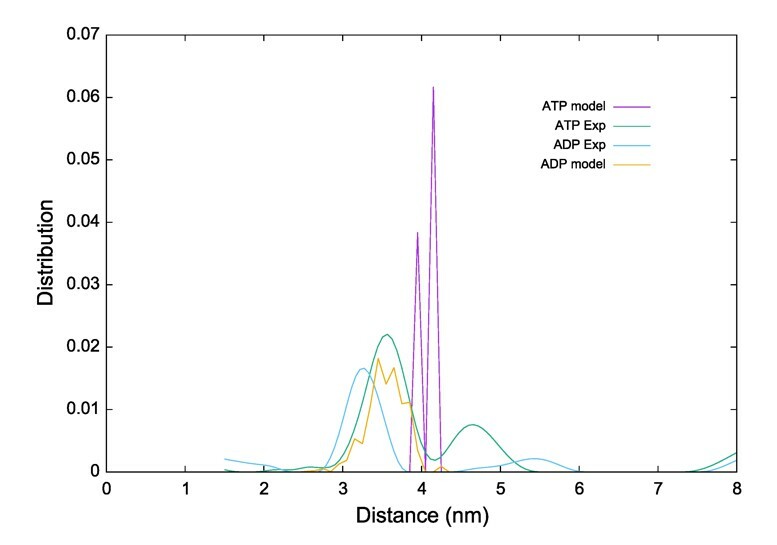 The calculation of the interspin distance distributions is based on the V. alginolyticus ADP- and ATP-bound KtrB2A8B2 models generated in this study for the comparison with the experimentally determined interspin distance distribution of the ATP- and ADP-bound conformation, respectively. A set of sequence homologs of KtrAB from V. alginolyticus was obtained by using NCBI BLAST against the non-redundant sequence database. The sequences were clustered using the CD-HIT (Huang et al., 2010) webserver based on the sequence similarity, in which sequences with more than 70% of sequence identity were put in one cluster. In each cluster, a representative sequence was kept and other sequences were discarded. This procedure resulted in 116 sequences. Multiple sequence alignments of KtrA and KtrB homologs were then generated using PSI/TM-Coffee (Chang et al., 2012). The initial multiple sequence alignments were accordingly refined by (i) considering the pairwise alignments between KtrA/B sequences from V. alginolyticus and B. subtilis, generated using AlignMe (Stamm et al., 2014) and (ii) removing gaps in the secondary structure elements and the transmembrane regions. The KtrAB system from V. alginolyticus was modeled based on the ATP-bound X-ray crystal structure of KtrAB system from B. subtilis (PBD code 4J7C [Vieira-Pires et al., 2013]) using Modeller 9v16 premised on the final sequence alignment (Sali and Blundell, 1993). Among 100 candidates, the model with the highest Modeller score was selected for further analysis. We performed all-atom explicit solvent MD simulations of lipid membrane-embedded KtrAB, starting from the homology model. According to MCCE (Alexov and Gunner, 1997) electrostatics calculations for neutral pH, all Asp, Glu, Arg and Lys residues were charged. All His residues were neutral, protonated at either their Nδ or Nε atoms according to the network of hydrogen bonds. The poorly resolved C-lobe part of KtrA was not included in the model. ATP-bound KtrAB was embedded (Wu et al., 2014) in a bilayer of 554 palmitoyl-oleoyl-phosphatidylcholine (POPC) lipids. The protein was hydrated with 150 mM KCl electrolyte, resulting in a box size of ~15 × 15 × 14 nm3 containing 300,024 atoms. The all-atom CHARMM36 force field was used for the protein, lipids and ions, and TIP3P was used for water molecules (Best et al., 2012; Jorgensen et al., 1983; Klauda et al., 2010). The MD trajectories were analyzed with Visual Molecular Dynamics (VMD) (Humphrey et al., 1996). To improve the statistics and assess the consistency, for each system described in the paper two independent sets of simulations were performed. In these simulations, two different software packages were used, NAMD and GROMACS, because they offer different functionalities and operate at different computing speeds. Importantly, the results obtained with the two simulation packages are fully consistent. For a better overview, the MD simulation setups are summarized in Table 1. In the analysis of water accessibility, we report the combined results of both setups (NAMD and GROMACS) for each system. Description of the different MD simulation systems and setups performed in this study. A first set of MD simulations of the two systems was performed using NAMD 2.9 (Phillips et al., 2005). After 10,000 steps of conjugate gradients energy minimization, 10 ns of MD simulation were carried out, in which all non-hydrogen atoms of the protein were constrained to their initial positions using springs with progressively smaller force constants, starting at 15 kcal·mol−1·Å2. The analysis was carried out on unconstrained simulations. Periodic boundary conditions were used, with particle-mesh Ewald electrostatics, a 1.2 nm non-bonded cutoff, a time step of 2 fs, SHAKE constraints on all bond lengths (Ryckaert et al., 1977), and a constant temperature of 310 K maintained by a Langevin thermostat (Adelman and Doll, 1976) with a coupling coefficient of 1.0 ps−1. A Nosé–Hoover Langevin barostat (Feller et al., 1995) was used to apply a constant pressure of 1 bar normal to the membrane plane. The ratio of the membrane in the x-y plane was kept constant while allowing fluctuations along all axes. A second set of simulations was performed using GROMACS 5.0 (Abraham et al., 2015). The starting systems were minimized for 50,000 steps with steepest descent energy minimization and equilibrated for 10 ns of MD simulation in the NPT ensemble in which all non-hydrogen atoms of the protein were restrained to the fixed reference positions with progressively smaller force constants, starting at 1000 kJ·mol−1·nm2. Analysis was carried out on unconstrained simulations. Periodic boundary conditions were used. Particle mesh Ewald (Darden et al., 1993) with cubic interpolation and a 0.16 nm grid spacing for Fast Fourier Transform was used to treat long-range electrostatic interactions. The time step was two fs. The LINCS algorithm (Hess et al., 1997) was used to fix all bond lengths. Constant temperature (310 K) was set with a Nosé-Hoover thermostat (Hoover, 1985), with a coupling constant of 0.5 ps. A semiisotropic Parrinello-Rahman barostat (Parrinello and Rahman, 1981) was used to maintain a pressure of 1 bar. 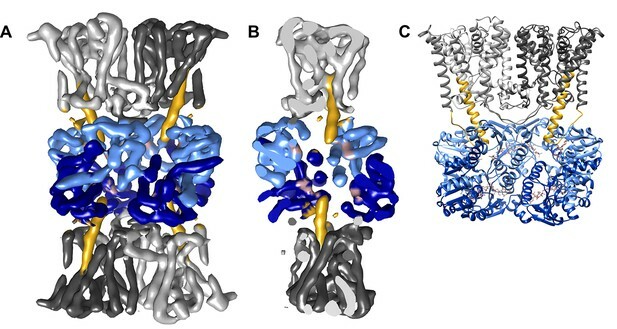 All-atom explicit solvent molecular dynamics (MD) simulations were also carried out for the lipid-membrane embedded KtrB of B. subtilis, starting from the ATP-bound X-ray structure (PBD code 4J7C [Vieira-Pires et al., 2013]). The procedure is the same as described for the homology models. Briefly, KtrB was embedded in a bilayer of 509 POPC lipids and hydrated with 150 mM KCl electrolyte, resulting in a box of ~14.6 × 14.6 × 10 nm3 (195,255 atoms) in size. The simulations were performed using GROMACS 5.0 and NAMD 2.9 with a length of 400 ns and 240 ns, respectively. Simulations of ADP-bound KtrAB are described at the end of the following section. In the MDFF simulations, the homology model of KtrB2A8B2 was used. The MDFF plugin v0.4 in VMD1.9.2 was used to perform molecular dynamics simulations guided by the cryo-EM density map (Trabuco et al., 2008). The MDFF simulations were performed in vacuum and with a g-scale factor of 0.3, which describes the strength of the external potential derived from the EM density map. Initially, the KtrB2A8B2 model was docked rigidly into the cryo-EM density with Situs 2.7.2 (Wriggers, 2012) (colores module). Afterwards, a 500-ps MDFF simulation was performed followed by 5000 steps of energy minimization. Secondary structure, chirality, and cis-peptide restraints were used during the MDFF simulation in order to enforce the original secondary structure, chirality, and isomerism. Additional domain restraints were used for the D2M1 helix during the MDFF simulation to maintain its integrity. The density cross-correlation coefficient, used as fit quality indicator, improved from 0.70 in the initial model to 0.89. The D1M2 and D4M2 helices could not be directly fitted from the broken form of the ATP-bound conformation into the continuous helix of the ADP-bound state. Therefore, these helices were modeled as a continuous helix using Modeler (Sali and Blundell, 1993) and then this refined model was used for fitting. Afterwards, all-atom simulation systems were set up for the EM-fitted model similar to the conditions described above for the ATP-bound model. Briefly, KtrAB was embedded in a bilayer of 555 POPC lipids, and hydrated with 150 mM KCl electrolyte. MD simulations in NAMD 2.9 and GROMACS 5.0 were 200 and 450 ns long, respectively. To assess the role of the intramembrane loop on the hydration state of the gating region, additional starting structures were created in which this loop was modeled blindly. In this way, the KtrAB system apart from the loop (residue 315 to 323) from V. alginolyticus was modeled based on the ATP-bound X-ray crystal structure of the KtrAB system from B. subtilis (PBD code 4J7C [Vieira-Pires et al., 2013]), whereas the loop was modeled de novo by using Modeller 9v16. Ten models were selected in which the mean distance for T318 probes was close to the experimental value of the pulsed EPR measurements. Following the protocol described above, 60-ns long MD simulations using GROMACS were performed for each of these models. The growth complementation assays were performed as previously described (Tholema et al., 2005). The Journal of Chemical Physics 64:2375–2388. Journal of Biological Chemistry 282:35046–35055. Nature Structural & Molecular Biology 14:180–182. Current Protocols in Protein Science, 74:Unit 17.17, 10.1002/0471140864.ps1717s74, 24510645. Journal of Biological Chemistry 285:10318–10327. Journal of Biological Chemistry 285:28210–28219. Journal of Computational Chemistry 18:1463–1472. Journal of Biological Chemistry 290:16393–16402. Journal of Biological Chemistry 282:14018–14027. Journal of the American Society for Mass Spectrometry 18:1429–1438. Archives of Biochemistry and Biophysics 259:157–163. Bioscience, Biotechnology, and Biochemistry 58:1512–1513. Journal of Magnetic Resonance 213:316–325. The Journal of Biological Chemistry 255:3824–3825. Biochimica Et Biophysica Acta (BBA) - Biomembranes 1788:2092–2100. Journal of Biological Chemistry 275:735–741. Journal of Biological Chemistry 281:7737–7746. The Journal of General Physiology 47:329–346. Handbook of Biological Physics 2:499–473. Journal of Biological Chemistry 280:41146–41154. Acta Crystallographica Section D Biological Crystallography 68:344–351. Journal of Computational Chemistry 35:1997–2004. Thank you for submitting your article "Helical jackknives control the gates of the double-pore K+ transporter KtrAB" for consideration by eLife. Your article has been reviewed by three peer reviewers, and the evaluation has been overseen by Kenton Swartz as the Reviewing Editor and Richard Aldrich as the Senior Editor. The reviewers have opted to remain anonymous. Diskowski et al. convincingly show that the mechanism of inactivation of the KtrAB K+ channel differs from those of other K+ channels regulated by RCK domains. Specifically, the authors report an ADP-bound structure of the KtrAB complex from V. alginolyticus, obtained through cryo-EM at 6-7 A resolution, and assumed to reflect the inactive state of the channel. When compared with the ATP-bound structure, reported elsewhere, this structure indicates that inactivation results from a series of structural changes in the RCK domains (upon displacement of ATP by ADP), which in turn foster/permit changes in the secondary – and tertiary structures of the channel domain, so as to close off the permeation pathway on the intracellular side. The authors speculate that this mechanism differs from those of other RCK-regulated channels because the RCK domains are not directly linked to the channel domain, which is plausible though not self-evident. In any case, the mechanism inferred from the structure is undoubtedly novel and would be of interest to the membrane biophysics community. Importantly, key aspects of the proposed mechanism are also supported, at least qualitatively, by complementary EPR spectroscopy measurements. Specifically, the EPR data indicates that a flexible loop known to serve as a reversible intracellular gate in the ATP-bound, active state of the channel becomes more immobilized in the ADP-bound state – consistent with the notion that inactivation results from a more robust structural occlusion of the permeation pathway. EPR measurements are also qualitatively consistent with the proposal that one of the helices in the channel domain has the capacity to adopt multiple configurations, and that ADP binding favors the more extended form, as seen in the cryo-EM structure. 1) The reviewers concur that your claim that "the ATP-bound conformation is most likely the preferred state of KtrB in the absence of the RCK domain", i.e. that "in the absence of the [Ktr]A subunits, the extended α-helix of the ADP-bound conformation" is unstable, is not directly supported by the simulation data currently provided in the manuscript (Figure 5E, F/Figure 5—figure supplement 1). Therefore, the reviewers request that you either provide a calculation specifically designed to probe the relative stability of these two conformations (i.e. a free-energy difference calculation, or a sufficiently long unbiased simulation where the two conformations are sampled spontaneously), or that you remove these statements and the related simulation data. Similarly, the reviewers question your conclusions regarding the dynamics of the gating loop, and its impact on the degree of hydration of the channel interior (Figure 6C and Figure 6—figure supplement 2), given that the structure of this loop is not resolved in the proposed inactive state – implying the loop was modeled, somehow. Thus, in order for the reviewers to be able to evaluate your conclusions, they request that you explain how this loop was modeled, and that you provide evidence of the validity or expected accuracy of your approach – for example by blind-modeling the structure of this loop in active KtrB, and comparing the prediction with the actual experimental result. Alternatively, you might opt to also remove this portion of the study. If you decide to preserve the simulation component, the reviewers also request that you describe the similarities and differences between the two simulations conducted for each molecular system, and that you clarify what the source of the data is for each of your figures. 2) In the subsection “Helix D1M2 connects KtrB with KtrA” and Figure 5, the Q band DEER data (the dipolar evolution traces) have very poorly defined features which reflect rather fast T1 relaxations. An issue that is particularly worrisome on the mutant at position 122. This is reflected in the calculated distance distributions, which give rise to broad and overlapping peaks and it might be a consequence of conformational heterogeneity at position 122. In contrast, however subtle, the differences in raw data for the dipolar evolution at position 318 that monitor gate opening, are more believable and reflect tighter distance distributions (in spite of the increased noise). Also, surprisingly, the X bad DEER data at position 318 display easily interpretable features in spite of the increased noise. We request that the authors consider alternatives to the results at position 122. We would recommend considering different labeling site at helix D1M2 with improved dipolar evolution behavior to bring this home. Although the existing DEER data does not go against the overall gating model, given a single credible set of DEER distance distributions it would be a stretch to claim this data as a direct demonstration of the present model. The authors should also openly discuss the problems with their data at position 122 and temper their conclusions accordingly. 3) The model does not actually explain how the channel is activated. To their credit the authors acknowledge this shortcoming, and suggest that activation may be due to a range of additional, unidentified, interactions, including a role of the lipid membrane, which they say changes in response to osmotic shock. We were left wondering whether they tried to measure their EPR distances on helices D1M2 in liposomes of different lipid composition? They do for the gating region, (Figure 5B). In the case of BetP, which is also regulated in response to osmotic shock, specific anionic lipids play key roles in regulating structure transitions within the transporter. We wonder if something similar is happening here? Have the authors tried to determine the structure in the presence of specific Vibrio alginolyticus lipids? These may have been stripped during purification? 4) The authors should also clarify what is known about the gating properties of the channel. Once activated, will it remain in an open state for long periods of time? If so, one would expect some structural stabilization of the gate region. The absence of such an interaction from the crystal structures and EM structure here suggests some component of the system may be missing in these studies, possibly lipid. Currently it reads to me as though the binding of the ATP puts the channel in a state that is able to stochastically sample the open state in response to electrostatic interactions with K ions – yet the paper implies that ADP-ATP exchange causes structural rearrangements that lock, or stabilize the closed/open states via the linking helices. The authors should better develop what is known about the gating properties of the channel and discuss their model in that context, clearly pointing out ambiguities that remain. Thank you for resubmitting your work entitled "Helical jackknives control the gates of the double-pore K+ uptake system KtrAB" for further consideration at eLife. Your revised article has been favorably evaluated by Richard Aldrich (Senior Editor), Kenton Swartz (Reviewing Editor), and two of the original reviewers. The Reviewing editor and reviewers agree that the revised manuscript is improved and that the work is appropriate for eLife. However, reviewer #1 feels strongly that the data in Figure 5E, F/Figure 5—figure supplement 1 and the statements in the second paragraph of the subsection “Helix D1M2 connects KtrB with KtrA” should be removed because they are not valid, as pointed out in the original critiques. His/her request is elaborated below. We would be pleased to receive a suitably revised manuscript and proceed with acceptance of the manuscript. "[…] we agree that the thermodynamic stability of the different D1M2 conformations cannot be inferred quantitatively from our MD simulation data. Full-fledged free energy simulations and/or sampling of reversible transitions of such large-scale changes are not feasible. We therefore followed the recommendation and toned down the discussion." I disagree with the authors' view that it is unfeasible to carry out a free-energy simulation to probe the proposed conformational change in the D1M2 helix, in the absence of KrtA, to demonstrate whether the extended conformation requires KtrA to be stable, or whether this region favors instead the "broken" form. However, I recognize now as I did originally that this isn't a trivial task, and that it might be beyond the expected scope of this study. It is equally clear to me, though, that the existing simulation data (Figure 5E, F/Figure 5—figure supplement 1) does not provide any meaningful information on this matter. There's no direct relationship between the relative stability of these two states and the descriptor calculated from the simulation (the RMSF for either state) – neither quantitatively or qualitatively. It is for these reasons that our original request was that either a suitable calculation is presented, or that "you remove these statements and the related simulation data", meaning the data in Figure 5E, F/Figure 5—figure supplement 1 and the statements in the second paragraph of the subsection “Helix D1M2 connects KtrB with KtrA”. It was not simply recommended that the discussion be toned down. Therefore, I cannot recommend the publication of this manuscript in eLife in its current form. I would be more than willing to do so if the authors complied with this straightforward request – which is no way detrimental for this study. The main conclusions of this paper are based on the cryo EM structure and supporting information from EPR and MD. I think that overall the authors have tried to address the main points and have toned down their conclusions based on the MD analysis. Our suggestion that additional sites be tested in the EPR section proved difficult to obtain, as expected, although the authors have presented data supporting their statement that most residues in the extended helix gave poor or difficult to interpret distance distributions. The authors however stand by their claim that the data qualitatively supports their argument of a structural transition in the D1M2 region following ATP/ADP binding and I would agree with this conclusion. On my specific query regarding the role of lipids, they didn't actually address, instead performing a set of additional experiments in detergent measuring the flexibility in the presence of nucleotide, which does support their arguments, but didn't address the more important question on the role of lipids in stabilizing the D1M2 region. This was never going to be a deal breaker anyway. I am still in favor of this paper being published, as the structural work does present novel insights into the gating mechanism within this K+ channel family. The 6 A maps are more than clear enough to propose the jackknife model from a structural perspective. The authors have made suitable changes to the text and data to better support their conclusions, which I think are, on the whole, justified. 1) The reviewers concur that your claim that "the ATP-bound conformation is most likely the preferred state of KtrB in the absence of the RCK domain", i.e. that "in the absence of the [Ktr]A subunits, the extended α-helix of the ADP-bound conformation" is unstable, is not directly supported by the simulation data currently provided in the manuscript (Figure 5E, F/Figure 5—figure supplement 1). Therefore, the reviewers request that you either provide a calculation specifically designed to probe the relative stability of these two conformations (i.e. a free-energy difference calculation, or a sufficiently long unbiased simulation where the two conformations are sampled spontaneously), or that you remove these statements and the related simulation data. In response, we agree that the thermodynamic stability of the different D1M2 conformations cannot be inferred quantitatively from our MD simulation data. Full-fledged free energy simulations and/or sampling of reversible transitions of such large-scale changes are not feasible. We therefore followed the recommendation and toned down the discussion. In particular, we now emphasize the higher flexibility of the D1M2 region in the absence of KtrA, which can be deduced from the enhanced RMSF values. Similarly, the reviewers question your conclusions regarding the dynamics of the gating loop, and its impact on the degree of hydration of the channel interior (Figure 6C and Figure 6—figure supplement 2), given that the structure of this loop is not resolved in the proposed inactive state – implying the loop was modeled, somehow. Thus, in order for the reviewers to be able to evaluate your conclusions, they request that you explain how this loop was modeled, and that you provide evidence of the validity or expected accuracy of your approach – for example by blind-modeling the structure of this loop in active KtrB, and comparing the prediction with the actual experimental result. Alternatively, you might opt to also remove this portion of the study. In response, we now provide evidence that the detailed conformation of the intramembrane loop has a negligible effect on the hydration level of the gating region. Water would enter into the gating region from the cytoplasmic side and this entry would be mainly controlled by the conformation of D1M2 and D4M2. Originally, the intramembrane loop was modeled like the rest of the structure based on the X-ray structure from B. subtilis. Although we did not include any additional experimental data for the modelling, both ATP- and ADP-bound models have a good agreement with the EPR data for the T318 residue, as can be seen in Author response image 1. Following the suggestion of Editor and reviewers, we now check the effect of possible changes in the conformation of loop on the hydration level by generating additional blindly modeled loops. Whereas the rest of the structure was modeled based on the X-ray structure from B. subtilis, the loop region (residues 315 to 323) was modeled de novo using the program Modeller. Ten models each in ADP- and ATP-bound states were selected according to their consistency with T318 EPR data. We then performed simulations for each of these models. The results are included in the manuscript (subsection “Nucleotide-dependent K+ 183 gating”, last paragraph, Figure 6C) and show that the loop conformation has a minimal effect on the hydration level. If you decide to preserve the simulation component, the reviewers also request that you describe the similarities and differences between the two simulations conducted for each molecular system, and that you clarify what the source of the data is for each of your figures. The different MD simulation systems and setups performed in this study are now summarized in the new Table 1 and indicated in each figure legend. We agree that position 122 shows rather poor features with respect to a defined oscillation in the dipolar evolution traces compared to data from position 318. This result, however, would probably be the same for every single position in the extended helix, since our measurements are not solely restricted on the spin-spin distances of the KtrB homodimer but additionally include the interdimer distances within the KtrB2A8B2 sandwich. We have clarified this point in the revised manuscript (“Based on a MMM evaluation (Polyhach et al., 2011) of the different positions within our models’ D1M2 region, we selected the position that potentially undergoes the largest nucleotide-regulated conformational changes…”) and predicted distance distributions for the sum of all three possible distance distributions (Figure 5—figure supplement 3). The sum of multiple distance contributions explains the noticeable broad distance distributions and the limited oscillations in the corresponding dipolar evolution traces, both in the presence of ADP or ATP. Nonetheless, the dipolar evolution traces in the presence of ADP or ATP are significantly different from each other, clearly reflecting a conformational change from short to long distances. At this point, examination of the raw data is actually more reliable and conclusive than evaluation of the final distance distributions. For further clarification, we have repeated our measurements at very high ADP or ATP concentrations of 100 mM, as well as in the absence of additional nucleotides (cf. Figure 5—figure supplement 4). The measurements show a broad distance distribution in the absence of nucleotides, which indicates that the extended helix adopts different intermediates ranging from the ADP- to the ATP-bound conformation. At high ADP concentrations the fast decay in the dipolar evolution trace gets significantly more pronounced. In comparison to ADP-containing measurements, the ATP-containing measurements reveal a slower decay, pointing towards significantly reduced probability of short distances. With an increase of ATP concentration in the sample this effect becomes even more severe. However, in the presence of ATP the effect is less pronounced in the experimentally determined distance distributions, as one would expect. This observation is consistent with the fact that the d2 time of 3 µs provides reliable distance distributions, and consequently reliable distance probabilities with mean interspin distances only up to approximately 5.4 nm. Thus, the probability for the long distance could be even higher and the exact distance could be even longer, which in addition has been demonstrated by the validation tool. Taken together, the new Figure 5—figure supplement 4 reveals that in the apo-state the KtrAB conformation is more likely in a dynamic equilibrium. Furthermore, the direction of the conformational changes, towards small or long distances, is dependent on the nucleotide concentration. This is exactly what one would expect for a system that is regulated by competitive ligand binding. As proposed by the reviewers we, in fact, analyzed additional residues within the extended helix. However, as given by the MMM analysis (Author response image 2), most residues even in the ADP-bound conformation are too far away from each other to be properly resolved using the d2 time of 3-4 µs. Consequently, they would be indistinguishable from the distance distribution in the presence of ATP. Only three residues within the D1M2 region at positions 117, 118, and 122 were potentially suitable for further investigations. Cysteine variant 117 turned out to be instable upon purification. Spin-labeled variant 118R1 was in fact measured. However, due to restrictions in the T2 relaxation time variant Q118CR1 could only be measured with a d2 time of 2.8 µs, resulting in a reliable distance distribution range up to approximately 5.2 nm. Therefore, nucleotide-induced distance changes between the ADP- and ATP-bound conformations are difficult to resolve. In the dipolar evolution traces small changes are visible and the associated distance distributions indicate a loss of shorter distances in the presence of 1 mM ATP, however these data are less clear than those of variant 122R1. Thus, we decided not to include the data for variant Q118CR1 into the manuscript. Moreover, the aim of the EPR measurements in combination with MD simulations and the cryo-EM map was to proof the general existence of both conformations in dependence of the different nucleotides rather than gaining exact distances. We believe it is worth mentioning that evaluation of our new model using molecular replacement revealed densities for the extended helices in the crystallographic data deposited for the ADP-bound KtrAB structure from Bacillus subtilis by Szollosi and colleagues (pdb code 5BUT) in 2016. Apparently, the extended helices have been missed in their analysis because of the structure’s low resolution (6 Å) and the poor fit of the ATP-bound structure in this area, which was used for molecular replacement. We thus hypothesize that the extended helices are highly conserved among species and represent a general feature of gating regulation. We believe that now we are one step further in understanding the role of nucleotide binding to KtrAB, which is the topic of this paper: ATP binding to KtrA unlocks the cytoplasmic gate (intramembrane loop) within KtrB, while bound ADP keeps it in a closed conformation. KtrA thus functions as a gate keeper, which is also supported by the recently described inactivating function of cyclic di-AMP binding to the C lobes of KtrA in B. subtilis and other Gram positive bacteria. Further stimuli, as the previously discussed lipids or Na+, which has been described in earlier studies, are essential for stabilization of an open conformation. The elucidation of the effect of different lipid compositions goes far beyond the scope of the present study, as it will involve the establishment of reliable functional in vitro and in vivo assays. We agree with the reviewers that this is a very exciting aspect of future research, which we will surely investigate! Instead of further addressing the impact of different lipid compositions, we have now performed measurements on spin-labeled variant KtrAB-318R1 in detergent solution to investigate the mobility of the intramembrane loop dependent on the present nucleotide (Figure 6—figure supplement 3C,D). Those measurements, as well as those with proteoliposomes, show the increased flexibility of the intramembrane loop in the presence of ATP, which supports our hypothesis that the gate gets unlocked. In addition, we repeated our measurements of reconstituted variant KtrAB-318R1 using Q-band to gain a better signal-to-noise ratio (Figure 6D). A comparison of the measurements in detergent solution and in liposomes clearly shows the same trend, but also indicates a regulatory role of the lipid environment, as the occupied distances are shifted and seemingly more defined in the presence of lipids. Nevertheless, we decided to include the data of reconstituted variant KtrAB-318R1 in support of our discussion that additional stimuli are needed for complete KtrAB activation. We have addressed this point in the Results and Discussion. Furthermore, we emphasized the role of nucleotide binding in the main text. Additionally, we summarized in more detail what is known by now and what information is missing providing further research routes. As suggested by reviewer #1 we have now removed the data in previous Figure 5E, F/Figure 5—figure supplement 1 and the statements in the second paragraph of the subsection “Helix D1M2 connects KtrB with KtrA”. In addition, we have adjusted the Materials and methods section accordingly. IH thanks Prof. Evert Bakker for his mentorship. We thank Prof. Werner Kühlbrandt for his support of the cryo-EM and for his comments on the manuscript. Prof. Thomas Prisner and Dr. Burkhard Endeward are acknowledged for their support on the EPR measurements. We thank Edoardo D’Imprima for discussions and Drs. Juan Castillo-Hernández and Özkan Yildiz for computer support. This work was supported by the Max Planck Society and by the German Research Foundation via Emmy Noether grant HA 6322/3–1 (I.H. ), HA 6322/2–1 (IH), SFB 807 Membrane Transport and Communication (ARM, NM, GH and IH), and the Cluster of Excellence Frankfurt (Macromolecular Complexes) (ARM and IH). The cryo-EM map was deposited in the Electron Microscopy Data Bank with accession code EMD-3450. © 2017, Diskowski et al.